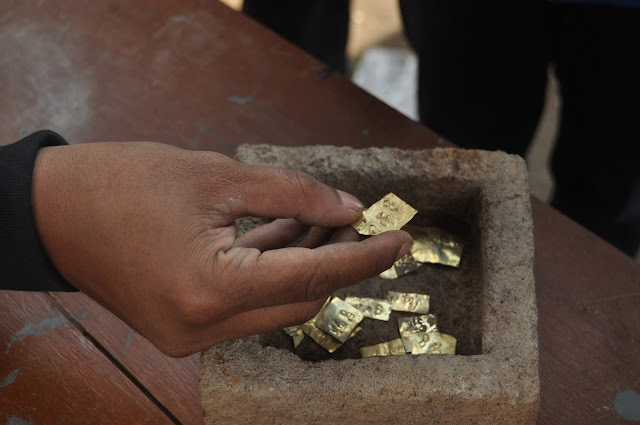 A group of people discovered 22 gold plates with ancient inscriptions inside a box in Ringilarik village in Java, Indonesia. One of the founders named Sumardi said that when they found it amongst a pile of rocks, it appeared to be a jewelry box which was clearly not of modern age and they were astonished to view the contents. Mr. Gutomo, an official with the Central Java Heritage Conservation Agency (BPCB) confirmed that the golden plates date back to the 8th century, 18 carats and the inscription of eight names of cardinal and original directions of Dewa Lokapala's windgods is in ancient Javanese letter. He said the founder and landowner will both receive compensation for this valuable discovery which provides insight into ancient history. Following the find, the structure of a candi (Buddhist or Hindu temple) was also found at the same location.